ATOMdesign Hammer Innovates, Perhaps Frightens | OhGizmo! Lose the baseball bat folks, because your new backseat equalizer is gonna have to be the S2 Hammer by ATOMdesign. ATOMdesign has reinvented the wheel by reinventing the hammer. Fortunately, S2 Hammer looks pretty awesome and can drive a nail in two hits. It is designed to split and reduce the shock to your hands and arms. Plus, it looks really cool. It stays true to old form with its carpenter’s favorite hickory handle and grooved head, along with a head-notch to hold nails. 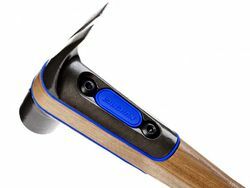 Apparently, a redistribution of the weight along with a more ergonomic form make the S2 Hammer a joy to use. Originally designed for Vaughn & Bushne, ATOMdesign’s S2 also won Best of Category award in International Design Magazine Product Design Competition, as well as Bronze Award in the International Design Excellence Awards, hosted by BusinessWeek. I really enjoy your blog. I linked to you at my page “The Eye for Innovation.” Thanks for the insights!